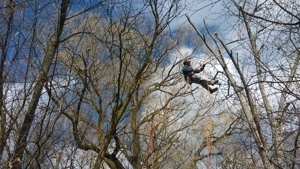 When you need exceptional tree care and tree maintenance, Michael Hoppe Arborist is your man. Serving the Wauwatosa area and surrounding communities since 1975, Hoppe specializes in tree fertilizing, Emerald Ash Borer removal, and Birch Borer treatments. These kinds of beetles have killed tens of thousands of Emerald Ash and Birch trees throughout Wisconsin. Fortunately, there is treatment available to keep your trees from succumbing to Borer infestation. But treatment should start as soon as you suspect that your tree or tree might be infected. Let an experienced arborist take care of trees and keep them in excellent health. Our tree maintenance services include tree and bush trimming, and tree and bush removal for residential and commercial clients. Call us today and let us come out and look at your trees. If you suspect Emerald Ash Borer or Birch Borer infestation, call us immediately for fast treatment and care of your trees. Call us today at (414) 616-3408 to find out more information about our tree care services. As tree experts, you're guaranteed to be impressed with our commitment to taking care of your trees while delivering quality customer service.